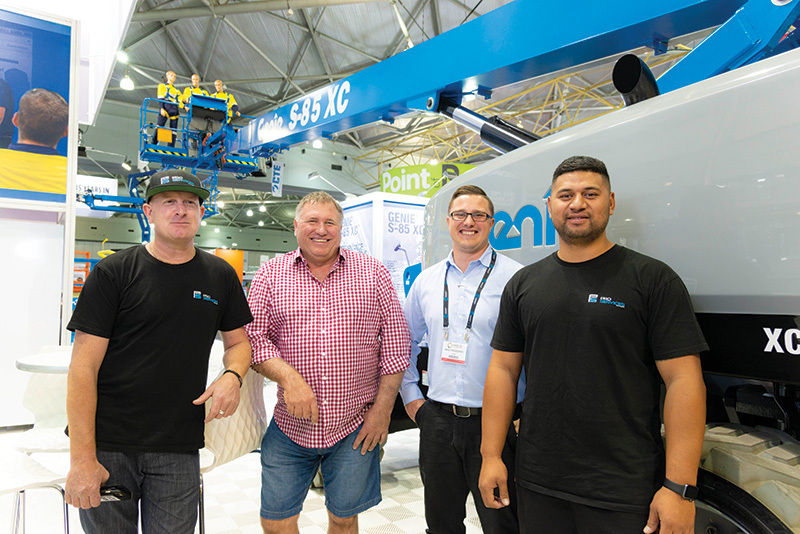 Evolving from high-end industrial rigging and fabrication company Rich Rigging, launched by Murray Rich in 1985, New Zealand firm Pro Services has confirmed its penchant for Genie® machines with a significant number of new purchases over the past six months. Co-owned by Murray and good friend Neil Radley, Pro Services has an extensive fleet of 220 access machines comprising of boom lifts, scissor lifts, telehandlers, forklifts, generators, aluminium scaffolding, lighting towers, trailers, cherry pickers and track booms lifts. “Rich Rigging was the first New Zealand business to take ownership of two mighty Genie® SX™-180 telescopic booms. Since then, subsidiary Pro Services has taken possession of one Genie S®-85 Xtra Capacity™ (XC™) boom lift,” says owner Murray Rich. Recently, the rapidly expanding Auckland-based Pro Services invested in several Genie S-65 Trax telescopic booms, self-propelled telescopic booms and a pair of the Genie GS™-4069 BE rough terrain scissor lifts. They have also taken delivery of two 50-ft Genie TZ™-50/30 trailer-mounted boom lifts and two Genie Z®-60/37 fuel-electric hybrid (FE) boom lifts, which are by far the best in the market. “The firm has an extremely varied client base from the movie industry to construction including commercial construction and infrastructure. The Genie S-65 Trax telescopic booms were delivered by Genie in matte black especially for movie sets whereas the Genie S-85 XC boom lifts and the Genie S-65 Trax telescopic booms will satisfy both the construction and movie industries, which is robust in Auckland and across New Zealand,” noted Neil. “Pro Services won’t be weight down by processes. If a machine is safe and can provide our customers with a solution, we’re in,” Neil adds.